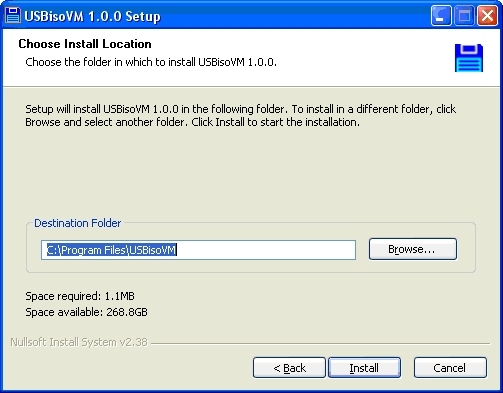 The Windows Client program is used to read data from the USBisoVM voltage monitor board. The client program stores all of the default variables and board settings in a database "USBisoVM.mdb". The database is located in the installation folder. An installer is provided. Follow the examples below to have the executable, dll, and database installed on your computer. When starting the client program for the first time, it looks to see if a board has previously been connected. If not, the add device dialog box pops up. 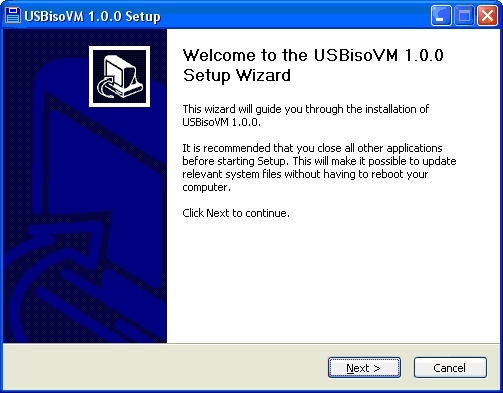 This list is automatically populated with however many USBisoVMs that are found to be connected to the host. 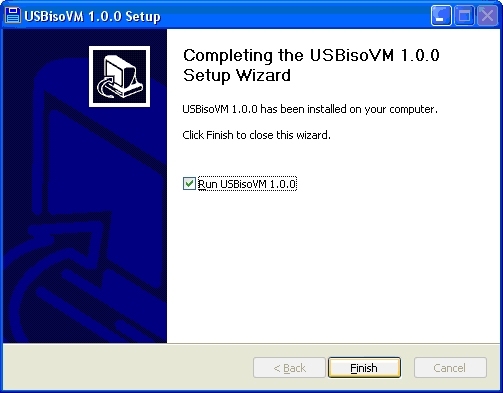 Each USBisoVM is programmed with a unique identifier. The "Refresh" button will re-poll the USB port and find any units plugged in. NOTE: Windows Vista and Windows 7 users must run the client program as Administrator. Select the desired unit and hit the "ADD" button. The selected device has now been added to the database. The main program will now appear. If the "Add Device" dialog box is closed without selecting a device, the main program will still open, however, a device will still need to be added in order to poll information. To add another device, click the "ADD Device" button. If there are multiple USBisoVMs in the list, you may make one default (shows up in the list box first) by selecting the "Set Default" button. If at any time you wish to remove a device, have the desired device selected in the drop-down menu and click the "Delete Device" button. 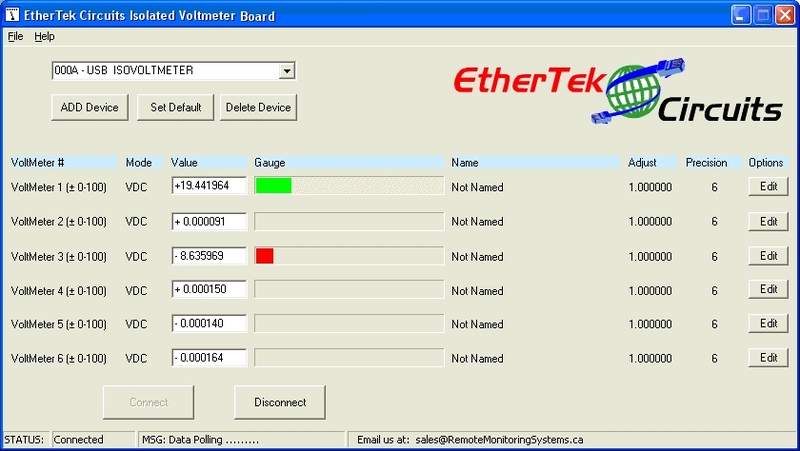 To start polling information, select the desired device from the drop-down menu and click on "Connect"
The program will connect to the USB isolated Voltmeter board selected and display the voltage per voltmeter onto the main screen. The value is in decimal under the "Value" column as well as displayed in the gauge. If the voltage is positive, the gauge will appear green, if negative, it will appear red. Name - Displays a name given to the voltmeter. 20 Characters MAX. In this screen, if the mouse hovers over the name, the notes on how the voltmeter is hooked up will appear. Mode - The voltmeter mode can be changed from "VDC" or "ADC"
Adjust - The adjustment value. The adjustment value is multiplied against the voltage reading and is displayed in the "Value" column. Precision - The desired precision to be displayed, this value can be 0-6. Default value is 6 decimal places. If any of these settings needs to be changed, or if more advanced features are needed, click on the "Edit" button. Each edit button is only applicable for the voltmeter of whichever row it is in. In the example below, the "Edit" button for Voltmeter 3 is clicked. "Voltmeter Polling" - When this is selected, data will be requested from the USBisoVM. However, if faster reading times are desired, then disabling some of the unused voltmeters can achieve this. When disabled, the value appears as "DISABLED". "Voltmeter Mode" - Select the desired mode for the voltmeter to be in. Voltmeter mode is default. The shunt mode will calculate the current based upon the shunt properties entered. 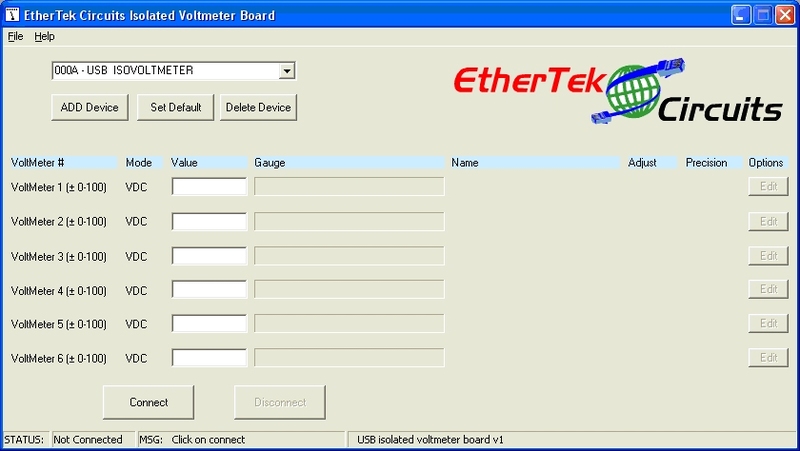 "Voltmeter Name" - This is where the Name of the voltmeter can be entered and edited. This will also appear on the main screen. "Shunt Properties" - This section is enabled once shunt mode is selected. Enter in the properties of the shunt being used. A typical value would be (Amp Rating = 5; Millivolt Reading = 50) for a 5A/50mV shunt. "Voltmeter Notes" - Enter in notes for reference on how the voltmeter is used. "Fine Tune" - There are 2 ways to fine tune the voltage reading. "Precision" and "Adjustment". Precision will alter to how many decimal places the voltage will show. This can vary from 0 to 6 decimal places. Adjustment is a multiplication factor against the voltage reading. This would most commonly be used for calibration or when reading a stepped-down voltage. 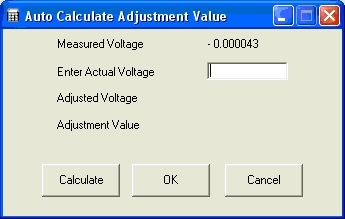 As an aide, the "Auto Calc" button will calculate the adjustment value needed to achieve the desired voltage reading. The desired voltage reading is "Actual Voltage". "Current Voltmeter Reading" - The real-time reading of the selected voltmeter. 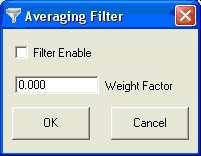 If desired, the averaging filter can be enabled by clicking on the "filter" button. The averaging filter will settle the voltage bounce readings. The weight factor should be between 0 and 1. The larger the number, the faster the answer is obtained. The lower the number, less bounce occurs. A good default is 0.05 if the precision is set to 6. The next section are the Triggers. These enable some control with the program. The available controls are; playing a sound (like an alarm) or executing a file (ie. A script to store the information). To use the triggers, the enable box must be checked. When a voltage is within a trigger range (as shown by the different colour bands), the action will only execute as often as specified by the "Test Every" pull down list. If a voltage is in the green (Normal Range), and moves past the High trigger value (MIN) into the yellow, no actions occur. Only if the voltage moves into the red range (past High Trigger Value (MAX)) will the action occur. If the voltage flutters into the yellow and back into the red, this does not reset any triggers. High Trigger condition range only exits once the voltage goes back into the green where it will execute the "High Normal Trigger" action only once. The same theory applies to the Low Trigger values. 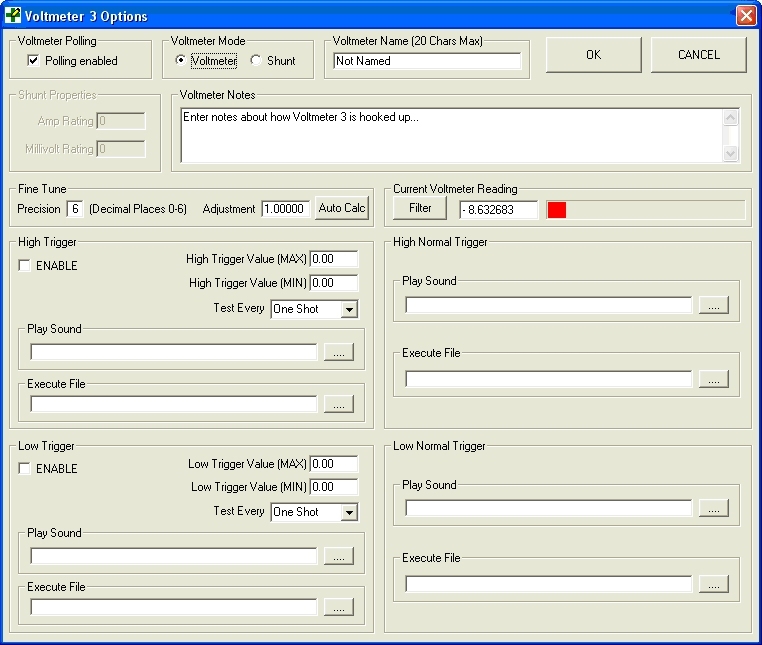 To log voltages to a file for later analysis choose "Logging" from the main pull down menu. Logging options can be set up for each voltmeter. Each voltmeter has its own log file. In the picture above, the maximum file size is set to 1 megabyte (1048576 bytes) with readings taken every 10 seconds. When the log file size goes over the set limit of 1 megabyte, the log file is deleted and a new log file is started. It is up to the user to determine how much hard drive space is available for log files and to do something with them before they are deleted. Below is an example of log file readings taken from a voltmeter log file. Each field in the log file: date, time, and voltage reading is separated with a semicolon. Each line in the log file uses 36 bytes (including the carriage return, and linefeed). A one megabyte log file can contain over 29,000 entries. Log files as large as 35 megabytes (36700160 bytes) can be chosen. To display your log files in a graph, choose "Graphs" from the main pull down menu. To zoom in, drag the mouse over the graph. To zoom out, click the left mouse button over top of the graph.